I told you guys I was working backward this week. So here is this weeks dessert recipe. I promise it doesn’t disappoint and it is super duper easy to make! 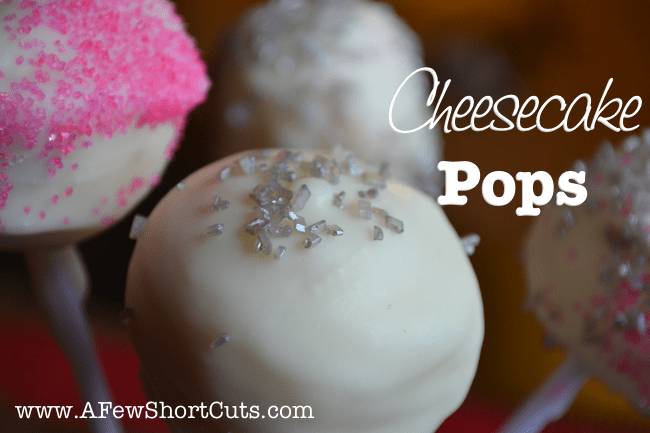 Cheesecake Pops. These are like cake pops but a million and one times better. They are the perfect New Years dessert, date night dessert, or just to cheer yourself up dessert. They took me less than 10 minutes from start to finish. Alot of the help comes from the fact that they are made with pre-made cheesecake. You can make your own, or purchase one from the freezer section at the grocery store. No matter which you choose these will be out of this world amazing. You need to check out this recipe and make these yourself. They are so creamy and decadent your friends and family will think you slaved for hours! With a cookie scoop or a spoon, scoop out 1 tablespoonful of cheesecake and use your hands to roll it into a ball. Place it on a plate. Continue to do this until you have the desired quantity of balls. Insert cake pop sticks and place the balls in the freezer. Melt the almond bark or candy melts according to package for dipping the cheesecake balls into. Remove the cheesecake balls from the freezer and dip them into the melted candy twirling to coat them evenly. Let any excess fall off back into the bowl and stick them into styrofoam mold or poke small wholes in a cardboard box to hold them while they set up. Sprinkle them with sprinkles while the candy coating is still wet. Place in freezer or fridge until ready to serve. If you want to make these gluten free make your own cheesecake filling minus the crust, or with a gluten free crust. These can be made a few days ahead of an event. Just freeze until ready to serve.